As of 1st March 2019 we have closed our bookings for the March and April tours. We are taking bookings and inquiries for the 2020 season. We intend to re-run a similar set of trips and schedules again for spring 2020. For spring 2019 we are offering six main cherry blossom tours. As in previous years we are continuing to offer a set of two week tours starting on a Sunday and ending back in Tokyo on the Saturday two weeks later. In addition, we have designed a set of shorter trips based around a ten day schedule. These shorter trips include the flexibility to add additional days at the start or end of the trip for those wanting additional free time in Tokyo or extra time to explore nearby locations. With most arrivals occurring on the weekend days this allows us to meet you at the airport, transfer you to your hotel in Tokyo and provide an initial introduction to Japan and Tokyo, one of the largest and vibrant cities in the world. This also provides you with free time to adjust to time-zone, and explore a few areas of the city that interest you before we head off on our journey around the country. We can normally accommodate guests arriving before the formal start of a tour as flights often do not line up with the tour dates in every case, this allows people flexibility to easily join a tour. Joining a tour: We try to meet you at your preferred arrival airport, but due to different schedules, that might not always be possible. If we are unable to meet you at the airport we will provide you with detailed instructions on how to join the tour. Departing a tour: Activities on a day where you are departing a tour will be adjusted to take into account travel time to the airport. Our draft 2019 tour brochure is available for download using the following link. The individual tour schedules are being updated and will be added progressively. Starting in Tokyo, before heading to the Japanese alps and the onsen town of Togura. After an overnight stop in Kanazawa travel south to Hiroshima and the beautiful Miyajima. From our most southern point we head back to the old capital of Kyoto, before heading back into the mountains to the picturesque town of Takayama. From here the two weeks is completed with the journey back to Tokyo. This tour is based on our "Best of Japan" schedule. With the first half more focused on history and scenergy, the latter portion begins to capture the approaching blossom season around the end of March, and with the return to Tokyo. Across the two weeks days after departing Tokyo this tour visits Hiroshima, Kyoto, Kanazawa and Takayama before returning to Tokyo. This trip provides good variation for sightseeing and travelling across the country and many opportunities to experience what Japan has to offer. The peak period for cherry blossom viewing starts in Tokyo at the beginning of April, including some of the famous and popular viewing locations around the city before heading south to Hiroshima and the island Miyajima with its floating torii gate. Leaving Hiroshima we head to Kyoto and a selection of its famous sights before heading west to Kanazawa and its famous Kenrokuen Gardens and castle. We then head to the mountains for a stay at a traditional Japanese inn and onsen before chasing the cherry blossom festival in the area around Sendai city, including a cruise around Matsushima Bay (considered one of the "three views of Japan".) The end of the tour sees us return to Tokyo for the weekend. Departing Tokyo this tour visits Kyoto for a selection of its famous sights (Nijo Castle, Kinkakuji, Fushimi Inari), and a few of the famous cherry blossom locations well known to the Japanese including one of the longest running annual festivals in Japan. We include a day trip to the first capital of Japan at Nara, before completing the southward journey to Hiroshima and the island Miyajima with its floating torii gate. Leaving Hiroshima we return to Kanazawa on the west coast of Japan for its gardens and castle before spending a night in the alps in Nagano prefecture. 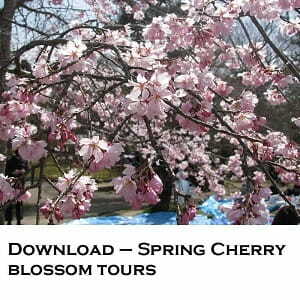 Our late cherry tour includes a trip to the north of Tokyo including side trips from Sendai (for Matsushima and Kakunodate), and also Aomori for the Hirosaki Castle Park, a site with 2,600 cherry trees and a beautiful cherry blossom festival. Returning to the centre of the country, we stay in the mountains at an onsen near Nagano and a visit to the snow monkeys before two days in the western city of Kanazawa and the mountain town of Takayama. From Takayama we take the scenic bus and train route via Matsumoto back to Tokyo. 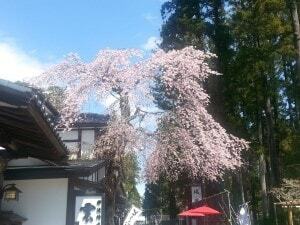 Our late spring tour is more focused on locations north of Tokyo and some of the interesting locations that have cherry blossom in late April including Sendai, Kakunodate (Akita), Hirosaki (Aomori) and Hakodate in southern Hokkaido. We price in Japanese yen, but can quote in your local currency on request. Early Cherry Blossom Tour: The price for fourteen days (accommodation for thirteen nights) is from Y595,000 per person share twin/double. Japan Spring Blossom Tour: The price for fourteen days (accommodation for thirteen nights) is from Y595,000 per person share twin/double. Classic Cherry Blossom Tour: The price for fourteen days (accommodation for thirteen nights) is from Y695,000 per person share twin/double. Heritage Blossom Tour: The price for ten days (accommodation for nine nights) is from Y525,000 per person share twin/double. Late Cherry Blossom Tour: The price for fourteen days (accommodation for thirteen nights) is from Y595,000 per person share twin/double. Northern Blossom Tour: The price for ten days (accommodation for nine nights) is from Y495,000 per person share twin/double. For solo travellers (one person, without a shared room), the cost of accommodation is unable to be shared, but we have a policy to limit the extra cost and have priced our tours for a solo travellers at Y125,000 above the shared/double/twin rate to partly cover the cost of accommodation. Our tour service, including a dedicated guide for the duration of your tour. That includes a meet&greet at the airport and transfers to the hotel in Tokyo. Accommodation, averaging 4* - 5* properties and usually including breakfast. We aim to book superior rooms to give additional space and comfort during your trip. Entrance fees for temples, shrines, castles, parks, gardens, and museums. These are listed in your agreed tour schedule. Evening meals at ryokan (Japanese inn) accommodation are normally included as well as breakfast. In general, we do not include lunch and dinner meals because Japan has a huge range of foods and we prefer not to restrict options, especially when food is a significant part Japan. Exclusions are generally items such as theatre performances, sporting or other special events, theme parks, lunch and evening meals, snacks/drinks and other incidental costs such as hotel room service/laundry. If you are interested in joining one of these tours, please contact us or email us directly at admin@japancustomtours.co.nz.